A woman who sees ghosts but can’t admit to them. A dead man haunting her, who can’t call himself a ghost. A betrayal. The best friend, who’ll never admit aloud that they know. A shadow, perhaps afraid to take human form. Broken antiques. An old pickup in the rain. A glowing white figure in distress. Room after room of art, fixtures, and objects of interest. “Just so typical of the dead to do whatever they want without caring how it might affect the living,” as our protagonist, Berenice, has it. Berenice in her pink blouse and wristwatch, a little out of step with time, but clearly present and alive. But, maybe this is the problem in a world of ghosts and haunted houses; maybe all are present. The present may be all any of us have, the only real existence, even if the present is only made up from an immaterial past and an un-materialized future. We don’t just live in a hauntology artifact. We are one. A haunted house, itself, is a haunting specter. As is every ex-lover, the eidola of family, the griefs and guilts, each private laugh and public humiliation. I fully believe that everyone involved in this comic intends me to consider these angles, to find myself haunting them like an unsure ghost. Jose Villarrubia, who brings it to life with his sincere color choices. Sarah Vaughn, from whom I have read no other comics, but whose talent I adore. Lan Medina, the artist who, along with some assistance from Phil Hester, made this one of the best comics to look at closely in all the last year. One of my lettering heroes, Janice Chiang. The cover artist who is so good someone should pull her out of the market just because she’s making it too hard for anyone else to measure up, Stephanie Hans. The editor, Marie Javins, whose name is always a promise of quality. I think they planned this. Deadman, aka Boston Brand, is a character who has existed longer than I have been alive, but I discovered him in Adventure Comics as a preteen. The Dark Mansion of Forbidden Love is a comic from nearer by birth, but it still predates me, and it was and is not a Deadman comic. Boston Brand does not appear in Dark Mansion. So, what is he doing in this Dark Mansion, but haunting it? This makes the comic a false version of something that existed before I was born. The semblance of a nostalgic reboot, missing all the familiar name features, containing what it never had. 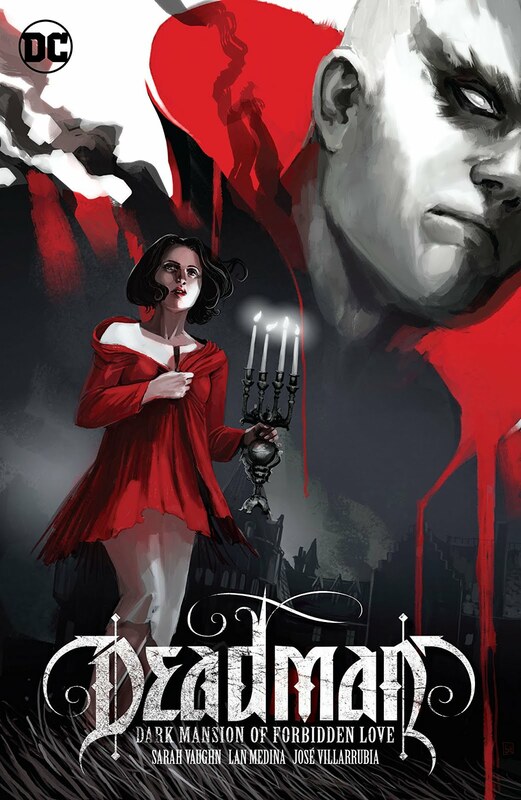 But, I suppose, they did append Deadman to the front of the title, so they are playing fairer than I give credit. I just don’t want to credit it. The way Berenice’s best friend, Sam, glues together the fragments of her busted antique, the pages come together into a fixed, but different whole, whenever I read the story they hold. Each room in the haunted Glencourt mansion, is wall to wall with paintings, portraits, sculptures, every door covered in ornate paneling, equipped with expensive, showy knobs. The bookcases are filled, not with uniform sweeps of matching volumes, but a variety of sizes and bindings, a used and eclectic but still well-kept and preserved collection. Like the dead who are housed there, and the living who are visiting or own it, there is a sense of weight and face to al the possessions, to all Glencourt possesses. 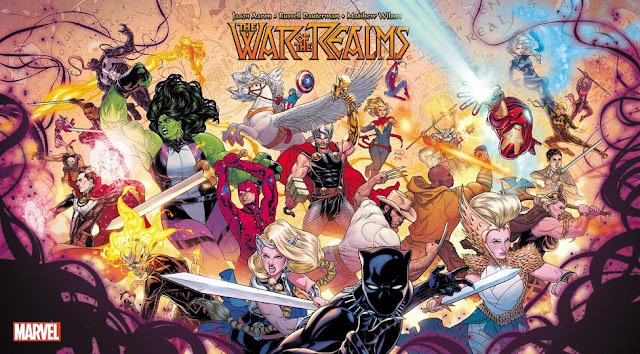 The sense of real and believed is of paramount concern in the comic, and its visual concreteness only strengthens the ephemeral nature of both belief and realness. A chandelier, on one page, is more gold, more gold gold, than any fixture I have seen in any other comic. Maybe, only flecks of other shades in the yellows, but it glows. The density of one ghost compared to another gives, ironically, the more solid-seeming phantom, the greater irreality, the more luminous the phantasm, the more they appear to be an atmospheric condition instead of a meat and bone person, the more their presence in anchored in being. It’s a secret of this comic, that there may or may not be other dead. Sometimes it is only us. Sometimes we can see less than others see. Sometimes, we see more. And, it is rarely entirely apparent, with any real surety, what the objective truth is. You struggle and you try and you occupy the place you have. You haunt the room you are afforded, or that you, yourself, afford. Like the ghosts, I want the comic to be an implausibility actuated. Both one thing and its contradictory opposite. Like the antique Berenice purchases on a whim, that is shattered before she can unpack it at her boyfriend’s expansive, ghost-ridden mansion, I want this comic to exist an irrevocable state of present, with an irretrievable past still embedded in each shard and detail. The pinks and blues and reds, the golds and whites, the hundreds of figures and figurines, from the phantom bodies of the dead to the de-limbed doll torso on the attic floor, I want the comic to be a nesting doll of haunted rooms, of haunting pages. One thing to be haunted. Or, to find yourself a ghost. What more, if you were the ghost haunting yourself? What changes? Does understanding what is in a picture, the whole picture, change that picture? If life is agency, can a ghost with agency be truly deceased? Is, to be in need, then, to be a kind of dead? After all, people in pictures are not people. They are images of people. And, there are images of people on every wall in Dark Mansion. There are images of people on every page. There is not a page of Dark Mansion that couldn’t make me cry, if I keep looking. If I am really fair to it. 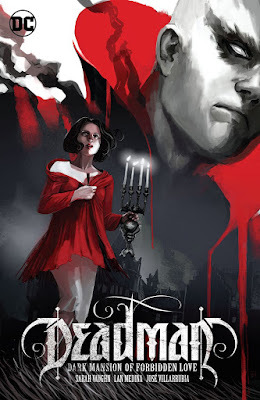 Deadman: Dark Mansion of Forbidden Love is currently nominated for a GLAAD’s Outstanding Comic Book Award. It is available at all the finest comics markets, including the one linked here.